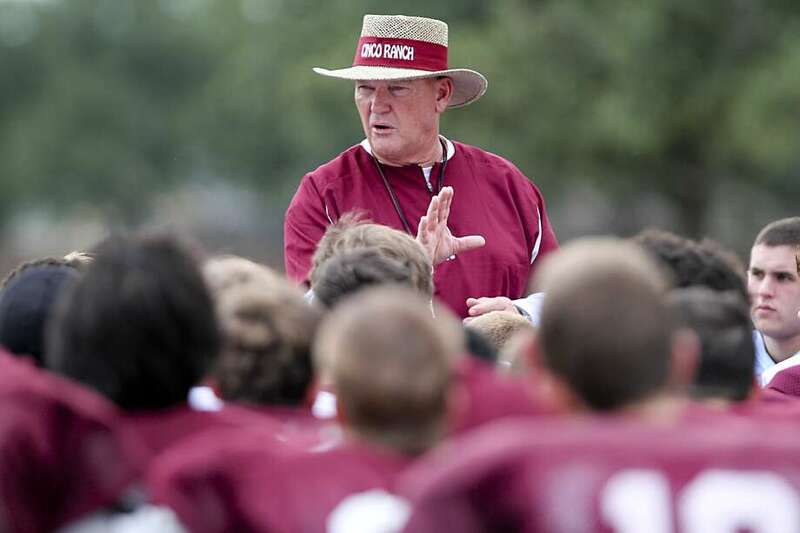 Don Clayton, the only football coach Cinco Ranch High School has ever known, is retiring. The 62-year-old Clayton informed his team of his retirement Monday morning, a day before the start of spring practice. His retirement is effective at the end of the school year. Clayton spent 38 years in the coaching profession and 20 of them were at Cinco Ranch, starting when the Katy ISD school opened in 1999. Under Clayton, Cinco Ranch became one of the Houston area’s most consistent football programs and under his leadership as athletics director, the school’s overall success in sports has been noteworthy. The Texas High School Coaches Association 2017 Hall of Honor inductee went 141-78 at Cinco Ranch, leading the Cougars’ football team to the playoffs 13 times. He led Cinco Ranch to the state semifinals in 2009 and 2016 and the 2008 district title is a notable highlight. It took Cinco Ranch just three years to achieve a winning record and five to make the playoffs for the first time. Clayton’s impact in the coaching profession goes beyond Cinco Ranch, to the point he’s considered a mentor to many other coaches. He’s had his hands in the development of the Bayou Bowl. He’s been the Region V director of the THSCA. He’s served on the board and as president of the Greater Houston Football Coaches Association, being a key figure in that organization. He’s served on the State 7-on-7 Board of Directors along with the Touchdown Club of Houston’s Player of the Year committee. Clayton, a graduate of Nederland High School, is in the athletics hall of fame at the University of Wyoming, where he played football and baseball. In between two assistant coaching stints under Mike Johnston at Katy in the late 1980s and mid-1990s, Clayton was the head coach at Livingston from 1990-1993. Along with Cypress Ranch, Crosby, Santa Fe, Galena Park and Coldspring, Clayton’s retirement gives the Houston area six football head coaching openings as spring practices loom. The Cinco Ranch job isn’t officially open yet, but Clayton said he expects administration to move quickly. Browse through the photos above for a look at the high school football coaching changes so far this offseason.